Vaginal bleeding and abdominal pain are the most common presenting symptoms of CSP. Severe acute abdominal pain or heavy vaginal bleeding are concerning for impending rupture, while hemodynamic instability may indicate rupture of CSP through the myometrium. However, up to 40 percent of patients remain asymptomatic prior to detection.2 Accurate sonographic localization of early pregnancies and recognition of salient imaging features of CSP are therefore critical in preventing maternal morbidity, directing treatment, and allowing for successful uterine preservation. Given the potential for serious complications, reliable diagnostic imaging criteria are needed to allow for timely recognition and intervention. 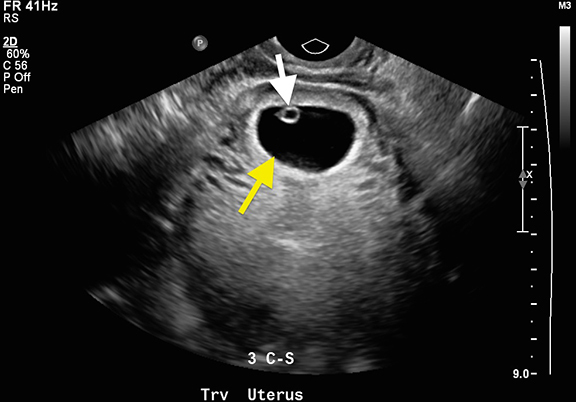 TVUS is highly sensitive for pregnancy localization and remains the imaging modality of choice for diagnosis of CSP in the first trimester, with reported sensitivity of 86.4 percent.1,3,6,9,11 A sagittal view along the long axis of the uterus through the plane of the gestational sac allows accurate localization within the anterior LUS.8,4,12,14 The following sonographic criteria have been proposed for diagnosis of CSP: empty uterine cavity with clearly visualized endometrium; empty cervical canal; gestational sac in the anterior LUS; and absent or deficient intervening myometrium between the gestational sac and bladder wall, typically <5mm.10 High velocity (>20cm/sec), low-impedence peritrophoblastic color Doppler flow (pulsatility index <1), resistive index < 0.5, and peak systolic:diastolic flow ratio of < 3.1 have also been described in cases of scar implantation.10 CSP can be distinguished from cervical ectopic pregnancy, low intrauterine pregnancy, or spontaneous abortion in progress by both location and thickness of overlying myometrium. 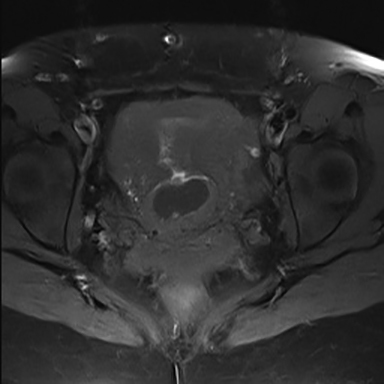 Cervical ectopic pregnancies will be located within cervical stroma, adjacent to the cervical canal, while normal low intrauterine pregnancies are seen above the internal os and should have normal-thickness overlying myometrium. 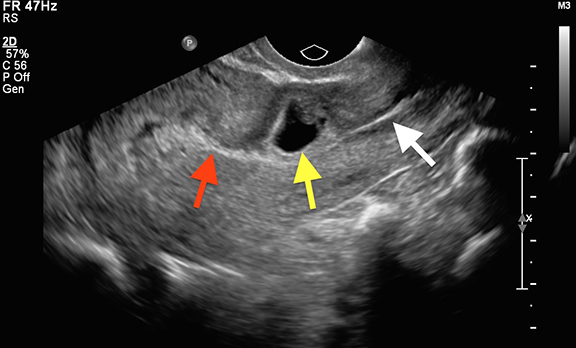 In cases of spontaneous abortion, the gestational sac will often appear collapsed or irregular, lack normal surrounding color Doppler flow, and may be displaced within the cervical canal when gentle pressure is applied with the endovaginal probe at the level of the internal os (the “sliding-organ” sign). 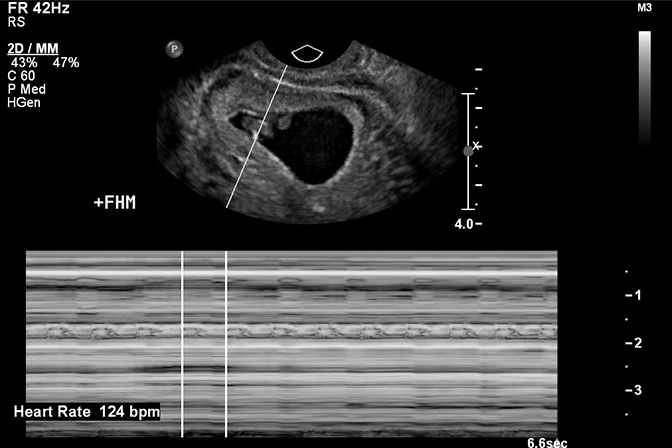 Short-term follow-up of a failed pregnancy will demonstrate lack of interval growth, and confirm that the gestational sac is not fixed in location. Both CSP and cervical ectopic pregnancies often contain live embryos with detectable cardiac activity, while an abortion in progress will not. Following scar implantation, those pregnancies which develop into the endometrial cavity may demonstrate varying degrees of placental invasion. Sonographic findings which suggest the development of placenta accreta spectrum include focal outward bulging of the uterine contour and obliteration of the normal myometrial-placental interface with abnormally increased color Doppler flow or focal absence of flow. Vascularized lacunae within the placenta, thought to represent areas of placental hemorrhage and infarction, are strong predictors of placenta accreta.15,16 The presence of placental tissue or vessels within the urinary bladder, with loss of the normal bladder wall reflector, indicates placenta percreta. Management decisions are dictated by gestational age and size, severity of implantation anomaly, clinical stability, and patient desire for future fertility. 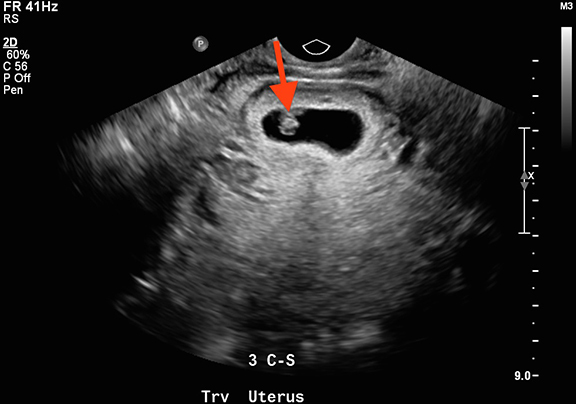 Termination of pregnancy in the first trimester is generally recommended due to the high rate of complications necessitating hysterectomy when allowed to progress under expectant management.1,13 Termination of pregnancy in the first trimester is still associated with substantial hemorrhage in 20-40 percent of cases; in such instances, bilateral uterine artery embolization (UAE) or intracervical vasopressin may be utilized for hemostasis. Even with timely intervention there remains a significant risk of complications. A 2012 retrospective review of 751 cases of CSP demonstrated a posttreatment complication rate of 44.1 percent, necessitating 36 hysterectomies, 40 laparotomies, and 21 UAEs.19 The highest complication rates were seen in patients treated with systemic methotrexate (62.1 percent,), dilatation and curettage (61.9 percent) and uterine artery embolization (46.9 percent). Medical therapy primarily consists of oral or intramuscular methotrexate, which can be given in conjunction with mifespristone or misoprostol to stimulate uterine contraction end expel intrauterine products of conception. Systemic methotrexate is effective in 71 percent to 80 percent of cases, and is most effective when the β-hcg level is less than 5000 mU/mL. Multiple doses may be required due to the relatively avascular fibrous tissue surrounding the gestational sac. Intraamniotic embryocide injection or surgical aspiration of the gestational sac is another option in hemodynamically stable patients with gestational age less than 8 weeks and no evidence of rupture.1 The combination of UAE and local methotrexate administration has been shown to have greater efficacy, fewer complications, and reduced need for subsequent hysterectomy compared to methotrexate alone.20 Isolated dilatation and curettage is generally contraindicated due high risk of incomplete evacuation, uterine rupture and injury to the bladder. Patients who do not respond to conservative measures may require laparoscopic or open excision, which allows for concurrent revision of the Cesarean scar to minimize risk of recurrence. Uncontrollable hemorrhage from placenta accreta or previa, uterine rupture or invasion of adjacent organs may necessitate open or laparoscopic hysterectomy. Ash A, Smith A, Maxwell D. Caesarean scar pregnancy. BJOG. 2007 Mar;114(3):253-263. Rotas MA, Haberman S, Levgur M. Cesarean scar ectopic pregnancies: etiology, diagnosis, and management. Obstet Gynecol. 2006 Jun;107(6):1373-1381. Wang CB, Tseng CJ. Primary evacuation therapy for Cesarean scar pregnancy: three new cases and review. Ultrasound Obstet Gynecol. 2006 Feb;27(2):222-6. Fylstra DL. Ectopic pregnancy within a cesarean scar: a review. Obstet Gynecol Surv. 2002 Aug;57(8):537-543. Gurel S, Sarikaya B, Gurel K, Akata D. Role of sonography in the diagnosis of ectopic pregnancy. J Clin Ultrasound. 2007 Nov-Dec;35(9):509-517. Jurkovic D, Hillaby K, Woelfer B, Lawrence A, Salim R, Elson CJ. First-trimester diagnosis and management of pregnancies implanted into the lower uterine segment Cesarean section scar. Ultrasound Obstet Gynecol. 2003 Mar;21(3):220-227. Rosen T. Placenta accreta and cesarean scar pregnancy: overlooked costs of the rising cesarean section rate. Clin Perinatol. 2008 Sep;35(3):519-529. 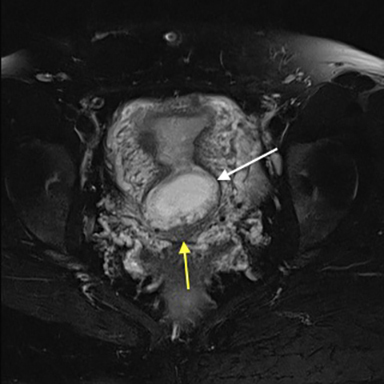 Maymon R, Halperin R, Mendlovic S, Schneider D, Herman A.Ectopic pregnancies in a Caesarean scar: review of the medical approach to an iatrogenic complication. Hum Reprod Update. 2004 Nov-Dec;10(6):515-523. Seow KM1, Huang LW, Lin YH, Lin MY, Tsai YL, Hwang JL. Cesarean scar pregnancy: issues in management. Ultrasound Obstet Gynecol. 2004 Mar;23(3):247-253. Vial Y, Petignat P, Hohlfeld P. Pregnancy in a cesarean scar. Ultrasound Obstet Gynecol. 2000 Nov;16(6):592-593. McKenna DA, Poder L, Goldman M, Goldstein RB. Role of sonography in the recognition, assessment, and treatment of cesarean scar ectopic pregnancies. J Ultrasound Med. 2008 May;27(5):779-783. Osborn DA, Williams TR, Craig BM. Cesarean scar pregnancy: sonographic and magnetic resonance imaging findings, complications, and treatment. J Ultrasound Med. 2012 Sep;31(9):1449-1456. Review. Ben Nagi J, Ofili-Yebovi D, Marsh M, Jurkovic D. First-trimester cesarean scar pregnancy evolving into placenta previa/accreta at term. J Ultrasound Med. 2005 Nov;24(11):1569-1573. Levine D. Ectopic pregnancy. Radiology. 2007 Nov;245(2):385-397. Lim PS, Greenberg M, Edelson MI, Bell KA, Edmonds PR, Mackey AM. Utility of ultrasound and MRI in prenatal diagnosis of placenta accreta: a pilot study. AJR Am J Roentgenol. 2011 Dec;197(6):1506-1513. Baughman WC, Corteville JE, Shah RR. Placenta accreta: spectrum of US and MR imaging findings. Radiographics. 2008 Nov-Dec;28(7):1905-1916. Wu R, Klein MA, Mahboob S, Gupta M, Katz DS. J Magnetic resonance imaging as an adjunct to ultrasound in evaluating cesarean scar ectopic pregnancy. Clin Imaging Sci. 2013 Mar 29;3:16. Lax A, Prince MR, Mennitt KW, Schwebach JR, Budorick NE. The value of specific MRI features in the evaluation of suspected placental invasion. Magn Reson Imaging. 2007 Jan;25(1):87-93. Timor-Tritsch IE, Monteagudo A, Santos R, Tsymbal T, Pineda G, Arslan AA. The diagnosis, treatment, and follow-up of cesarean scar pregnancy. Am J Obstet Gynecol. 2012 Jul;207(1):44.e1-13. Yang XY, Yu H, Li KM, Chu YX, Zheng A. Uterine artery embolisation combined with local methotrexate for treatment of caesarean scar pregnancy. BJOG. 2010 Jul;117(8):990-6. Ben Nagi J, Helmy S, Ofili-Yebovi D, Yazbek J, Sawyer E, Jurkovic D. Reproductive outcomes of women with a previous history of Caesarean scar ectopic pregnancies. Hum Reprod. 2007 Jul;22(7):2012-2015. 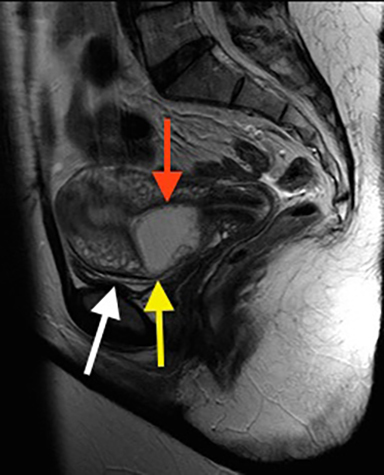 Maymon R, Halperin R, Mendlovic S, Schneider D, Herman A. Ectopic pregnancies in a Caesarean scar: review of the medical approach to an iatrogenic complication. Hum Reprod Update. 2004 Nov-Dec;10(6):515-523. Fenerty S, Gupta S, Anoakar J, Patel T. Cesarean scar ectopic pregnancy. Appl Radiol. 2017;46(12):20-21.